Spicer does argue that the prevalence of this recurrent figure has allowed modern representations to parody or insert comedy into the formula of the usually dark, masculine character – an approach which is adopted in Down Terrace (2009) – Wheatley’s previous film, and writing/directorial debut, that deals with the very same area of criminality. However, Kill List provides its own subversion through entirely different means. Though the film carries with it a sense-of-humour, it is the sense of reality that harbours the more disturbing nature of a person willing to embark upon such a career. Down Terrace hosts very similar themes to Kill List, and although they would seem separated by genre (crime-comedy and crime-horror) and the respective tone that entails, there is an observable overlap in the way Wheatley treats the audience. Centred around an asinine crime family, black comedy is dealt in botched murders by deeply flawed regular people. Although the comedy is derived from a certain progressive absurdity, there is a realness in the faults of even the nicest characters. The lines between hero and villain are effectively blurred by allowing the viewer access to both the good and bad sides of each individual. No-one is perfect and morals are dispensable. The conflict between hitmen and morality is confronted continuously in Kill List and linked to the underlying symptom of Post-Traumatic Stress Disorder. The story follows Jay and Gal, two veterans of the ongoing wars in Iraq and Afghanistan, who have returned home from an incident in Kiev eight months earlier. Revealed as a professional ‘hit’ gone wrong, the two are reintroduced to the business of contract killing through an unnamed Client and a ‘kill list’. This is all in the opening of the film which introduces us to the suburban home life of Jay where he resides with wife Shel and seven-year-old son, Sam. Hosting a dinner party for Gal and his girlfriend Fiona, tensions are high with the couple openly fighting: shouting at one another with conviction and passion. Wheatley gives insight to this creation of a reality not often shown on-screen, explaining that the act of shouting usually denotes feelings of hate, though everyone fights – especially with those they love. The realism of Kill List is pervasive and gritty, which allows its questions of morality to blend seamlessly into the narrative. Like Down Terrace, the usually independent hitman is shown untethered from a family, shackled to a seemingly contradicting duality of love and mercilessness. Morality arises constantly under the guise of Christianity – a ubiquitous series of symbols that lace through many of the scenes both overtly and subtly, conjured up as obstacles to Jay as he descends into increasingly brutal psychotic violence. This appears in the opening dinner party scene when Gal prompts to say Grace – to which Shel abruptly objects stating “not in my house!” An apparent overreaction that warrants further discussion about the conflicts in Ireland which Fiona does not fully comprehend – a misunderstanding that forebodes her own satanic beliefs and also serves to compare the faith based violence. In Bruges (2008), another recent, British crime film that plays as a black comedy, also follows two hitmen that are constantly confronted with religiously charged symbols as a sign of moral conflict. The two Irish killers are symbolically shown to be toiling with the Catholic ideals of sin and redemption, aided by the appearance of priests and churches. However, this is more in line with Spicer’s parodied ‘Angel of Death’ as we are shown the doubt and vulnerabilities that both men possess, as the brutal violence becomes a complimentary shock to the comedic scenes, not entirely dissimilar to the style of Down Terrace. A more overt challenge to Jay’s conscience is the first name in the list of designated targets, indicated by a large text title-card: The Priest. Here we are privy to the private opinions of Jay and Gal who justify their actions through attacking the morals of the church, talking of the incidents of paedophilia connected with priests before shooting him in the head. This self-justification is voiced by Jay later, stating “They’re bad people. They should suffer”: as far as Jay has convinced himself, he is doing nothing morally wrong. More than this, he views himself as a moral avenger. In the hotel restaurant Jay and Gal struggle to maintain a conversation when a group of Christians begin singing about their Lord. This ignites the short temper of Jay as he directly confronts the group. Reminded that God loves him by the guitar-playing evangelical, he responds by stating that he wants to be as far away from people like him and storms out of the room – a nerve has been struck. Playfully Gal apologises on his behalf and asks for them to put a good word in for him with ‘the big guy’. These men know what they do and actively dismiss the reminder of moral living and although Gal jokes about it, he is certainly more concerned with redemption. The climactic whiplash from change in genre may not give enough time to reflect on its implications: revealed as working for an organised cult, with its own twisted moralism, Jay reacts by killing off various members in their straw attire as they chase him through the woods. He believes that he is justified in righting those who are acting wrongly; he does not stop to think about his actions. The break in Jay’s character from efficient hitman to ruthless killer comes from a provocation of both paranoia and a sense of moral duty. This reactive aggression is harnessed by the cult members who apprehend him, fit him with a straw mask of his own and pit him against The Hunchback. Surrounded by flaming torches they commence fighting with blades. Once Jay instinctively kills this faceless being, the revealed identity of his wife and child evoke the only moment in which he can reflect on the blindness of his aggression and the corruption of his conscience. He has killed those closest to him with a distorted rationalisation that has followed him home from his service in the forces. As with the case of In Bruges, and even Pulp Fiction (1994), the use of a hitmen duo allows the killers to separate themselves from the seriousness of their situation, and escape into seemingly unimportant conversations. This technique allows the audience to relate to the human side of the character and therefore find empathy within them. Kill List makes this connection difficult with its unrelenting focus on the dark and unfunny side of murder. 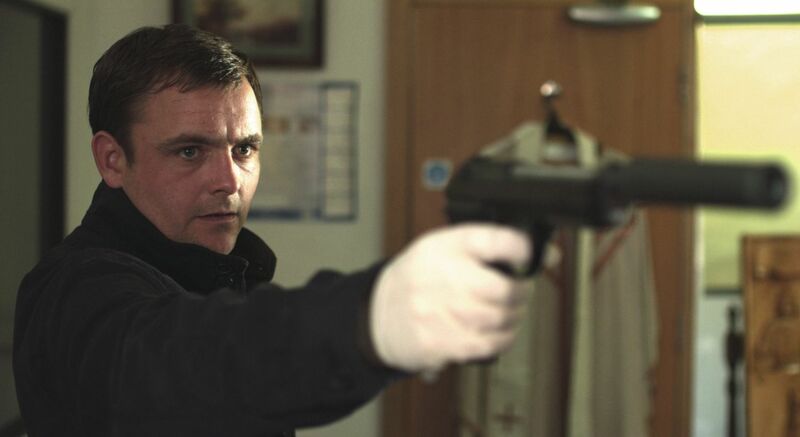 Whereas the other examples, including Down Terrace, use violence as comedic relief – Kill List uses violence as a reminder of the barbaric institution that is usually celebrated in film. Ben Wheatley addresses this commonplace representation when stating that hitmen have claimed the title of folk hero when really “they’re fuckers who kill people for money”.